Politically, Pennsylvania is a weird state, and its wine culture reminds us of that now and then. But the political weirdness of Pennsylvania has led to some really weird design parameters. These machines, to be placed in grocery stores, won't just take your $6 and dispense a bottle of White Zinfandel. They'll also check your ID and give you a breathalyzer test. Moreover, while the main purpose of vending machines is to reduce the need for sales staff, these apparently won't do that at all. A state employee -- and importantly, a union member -- will be sitting in a remote location watching the whole thing on camera. If your breath smells like bourbon in Punxsutawney, they'll know it in Harrisburg. So why build these life-size mousetraps at all? Why not just let the grocery stores sell wine? Well, therein lies a Tale Between Two Cities. Philadelphia is by far the state's largest city, and it's not so different from its nearby neighbor Baltimore: blue-collar, liberal and more sophisticated than the natives admit. Pittsburgh is a a rust-belt city akin to nearby Cleveland. In between the two, it's Utah. There's a large number of Amish and other religious groups who think wine is evil. They've formed an interesting coalition with labor unions and the state government; all three conspire to keep good wine from people for their own reasons. All Pennsylvania wine buying and selling is run by the state's Liquor Control Board. Sometimes this actually has advantages; as a giant retailer, the state has the power to dictate terms to suppliers and occasionally gets some great discounts. However, on sales of all wine, beer and spirits, the state rakes in huge taxes that the government has come to depend on. Every now and then there's a move to eliminate the LCB, but the state government would collapse without it. The LCB is unionized, which means thousands of secure jobs, which keeps urban liberal politicians from complaining too much about it. And then of course you have the neo-Prohibitionists, who think a free market in booze would turn the state, socially, into a horror show. Like, say, California. They're probably not wrong. Let your local convenience store sell Clos du Bois and the next thing you know, people are demanding gay marriage. Anyway, the manned, breathalzying, ID-checking robots sound really silly. But I'll take the PLCB at their word that they're really trying to improve customer service. The Data Kiosk: "I've taken the liberty of scanning your shopping cart. This barrel-fermented Chardonnay will be the perfect accompaniment for your roast chicken. It has acceptable total acidity of 0.67% because the diurnal temperature variation during the vintage year allo wed the grapes to respire in the evening. The dry extract is ..."
Rosie The Retailer: "Oh, sir, I know just the right bottle, let me check my memory circuits. The last time your wife was here she had a Merlot. Come closer, let me straighten your tie." 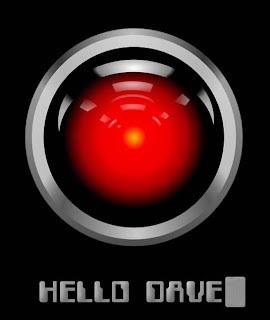 Model B-9, Class M-3 General Utility Non-Theorizing Environmental Control Robot: "Please breathe into the receptacle. Warning! Danger, Edward Rendell. This customer shows levels of intoxication. Warning! Warning! Danger, Edward Rendell!" 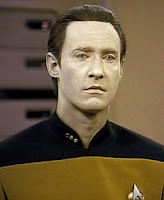 RoboSommelier: "Halibut with Cabernet is a Violation of Section 3.7 of the Sommelier Code. Step away from the kiosk. This is your first warning. Step away from the kiosk or put the halibut down. This is your second warning." 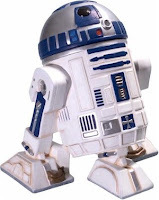 R2,Advocate2: "Eep ep eep ep ep ep ep 94 points."